Tushiev: You are not a frequent participant in open tournaments, how did you decide to play in Baku Open? 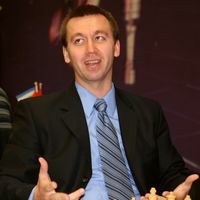 Kamsky: Yes indeed, I rarely play in opens, I prefer round robin super-tournaments. But my friends are playing here in Baku and it is always a pleasure to be in such a good company. Besides, in a couple of weeks from now I will play in the European Club Cup for team “Alkaloid” from Skopje. Shakhriyar Mamedyarov, Gadir Guseinov and Rauf Mamedov are my team-mates there. So I came here to play together with my club partners and to have good time with my friends. Also Novkhany is a great place, very nice resort, so one can play and relax at the same time. Kamsky: Yes, this happened. Of course, the defeat in that match had a strong influence on my later game. But the drop in my play mostly had nothing to do with chess. There are several other reasons. But I hope that I can slowly regain earlier form, and a tournament like Baku Open can definitely help me move into the right direction. Kamsky: Yes, but I will not play for the U.S. team at the World Team Championship. We have decided to give a chance to our young American players, so that they can obtain necessary experience. I should say that I myself have offered to give a chance and my seat to young boys. If it was a Chess Olympiad, then of course, I would be a part of the U.S. team, but the World Team Championship is not such important event. The juniors also need a competitive practice, so I will not play there. Speaking of the chances of Azerbaijani team, it has always been very strong. I remember when your team first appeared at the official competitions, when it was composed of a very young Azerbaijani chess players, that even then they created quite some noise. So you have a very serious, and most important, young team. This is the way it should be done, to attract young and ambitious players. Tushiev: It is possible that next year you will come to Azerbaijan again, as according to FIDE Deputy President Georgios Makropoulos, Baku has great chances to host Candidate Matches, in which you are already confirmed participant. How do you estimate chances of Baku to hold such a tournament? Kamsky: Honestly, I don’t know. At the present time, everything in the chess world is changing quickly and drastically, so it’s difficult to predict anything. But I think that if Baku wins this bid, then the playing conditions will get even better, as Azerbaijan knows how to organize high-level chess competitions. Azerbaijan has a great chance to host the Candidate Matches, scheduled to take place next year, and become part of the new championship cycle – follows from the conversation between FIDE Deputy President Georgios Makropoulos and Extratime.az reporter Teymur Tushiev. Georgios Makropoulos was in one-day visit in Baku, together with FIDE press secretary Berik Balgabaev. On Friday, FIDE delegation had a meeting with President of the Chess Federation of Azerbaijan Elman Rustamov and Youth and Sports Minister Azad Ragimov. - As you know, in May this year, during the match between Azerbaijan and the Rest of the World, an idea to organize Candidate Matches in Baku was born – said Georgios Makropolus. – Now we come to your capital, to finally prepare FIDE opinion about the possible organization of this event. It is a fact that Azerbaijan is not the only applicant for holding this tournament, so we had to speak directly with the Azerbaijani side. We were able to reach full understanding on all issues. There were only some small nuances that will also be addressed. The final decision will be made at the FIDE Congress, which will be held in October this year in Thessaloniki, Greece. - You mentioned that there are other candidates to host the Candidate Matches. Which ones? - I will not name these countries, but there is interest. But Azerbaijan was the first to had expressed a desire to hold this tournament and made a concrete proposal. Moreover, Azerbaijan has great experience in hosting prestigious tournaments at the highest level, the first stage of the FIDE Grand Prix being a good example. Therefore, FIDE decided to first consider the proposal of Azerbaijan, and it is our belief that Baku has a great chance to take Candidate Matches. - What are the basic conditions to win the right to host Candidate Matches? - First of all, of course, is to create the most favorable conditions for the participants and provide them with complete safety. This is the main condition. One of the important conditions is the provision of the prize fund, of which a certain percentage goes to FIDE. - What is the prize fund? - The prize fund is 504 thousand euros. I would also like to inform you that FIDE has included Azerbaijan’s national team in World Team Championship to be held in January next year in Bursa. This is not a surprise, given that the Azerbaijani chess players have achieved great results in the recent years, and that they occupy leading positions in the world rankings. The World Team Championship is featuring winners of the continental championships, three medalists from the Chess Olympiad, the hosting country. Also, there are two nominees, which are being offered by the organizer, and Turkey suggested Azerbaijan and Greece. FIDE endorsed the nominations. - What is happening with the last stage of the FIDE Grand Prix, can we clarify the situation? - Most likely, the last Grand Prix will take place early next year. The last few months of this year will be very busy for players who participate in Grand Prix – European Team Championship, World Cup in Khanty-Mansiysk and then the World Team Championship. Therefore we decided to move the last Grand Prix for the next year at the request of the players. FIDE will always try to accommodate the players and allow them to also participate in commercial tournaments. On 24th August, Teymur Tushiev revealed on Extratime.az pages that Azerbaijan Chess Federation is interested in appointing FIDE Vice-President Zurab Azmaiparashvili as captain of their national team. It is no secret that Azerbaijan holds high ambitions with the team composed of young and strong players, and it is believed that Azmaiparashvili’s experience might be that final piece in the puzzle to provide a top result. Thus far, Azerbaijan has one bronze medal from the official competitions, earned at the last European Team Chess Championship that was held in Creta Maris. Further in the interview, Tushiev and Azmaiparashvili discussed the possibility of holding Candidate Matches in Azerbaijan and then briefly touched upon the FIDE Grand Prix and its final tournament. From the tone, we have an impression that Grozny, earlier mentioned by FIDE President Kirsan Ilyumzhinov as potential host for the Grand Prix, is almost certainly ruled out because most of the players put safety in the first place. Read the full interview on Extratime.az (Russian language). 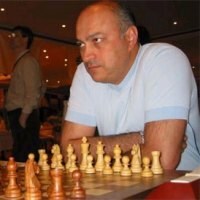 Update (16th September): The rumor was confirmed by Faik Gasanov, Vice-President of the Chess Federation of Azerbaijan, and Azmaiparashvili is officially captain of the Azerbaijan national team.